In conversation, Gary Clough talks about the fallibility of chance and human error as being one of the main reasons or provocation for being an artist. The artist can attempt to invoke something, but with our different cultural experiences and varied personal histories, what we as an audience understand is unique to each individual. While training at the Royal College of Art as a sculptor, Clough was fortunate in finding that he could arrive at a context through the careful selection of his materials. Twentieth century sculpture has taken many different forms. Artists such as Jim Dine, Claes Oldenburg and Richard Deacon choose to use a wide variety of materials. Others maintain an allegiance to stone, wood and metal. Clough could be identified with the latter as he has worked as a stone mason in both Wales and Scotland, but is in fact closer to the former and is not afraid to work with new materials. Clough has worked both in the classic studio setting as a Henry Moore Fellow at Falmouth College of Arts, as well as more recently working without a studio. Clough tailors his production techniques to suit his needs. Clough’s background as a stone carver has informed his development, slowing down the creative process and allowing him to progress with a variety of strategies. These appear as threads or pathways in earlier work. Pieces such as Shelving 1996 or Floored 1995, are echoed in the new work. The sly humour, the DIY references are still present. The new work also questions our preconceptions and perceptions. From traditional sculptor’s materials and in response to not working in a studio, Clough has moved on to film and video, using unconventional materials such a sdry transfer or plasticine. We associate the material with children, plasticine retains the immediacy of drawing and takes references from many sources. these stem from the work of artists like Philip Guston, to the drawings of Leonardo da Vinci, to catalogue product presentation. At once banal, engaging, funny, serious and playful. It is Clough’s intention to draw the viewer in through identifying or naming the parts: a telephone, a chair or a heart. We accept a Dutch still life painting as real, knowing that it is pigment in oil applied to canvas and not a half eaten meal, but it has the appearance of reality. Clough’s drawings are schematic and defy our understanding of real objects. Any notion of a commonality or generic form results from a shared knowledge or experience. Jasper John’s search for a torch for a cast was stymied by manufacturers who produced torches to look like a gun, a rocket or Mickey Mouse. They certainly did not look like our idea of a real torch. This is a complex game of associations as John Berger demonstrated; there is often a divergence between the artist’s intention and an audience’s expectations or reaction. The audience may well accept or reject an idea on the basis of only partially digested information. The artist is in a private and personal dialogue with the work in a way in which the audience can never be. We accept the visual over-stimulation that bombards our senses. We are used to low attention spans, a lack of focus, objects becoming peripheral. A television programme seen by one million viewers becomes the property of another few million viewers, who begin to imagine or believe that they too saw that programme. The programme become part of the common psyche. Clough admires the drawings of Claes Oldenburg. The way in which they describe the sense that these things really could happen. there is no compromise in drawing, anything is possible. In some ways the physical fact of an Oldenburg sculpture takes away the mystery and magic of a proposal drawing. Why do artists draw? The temptation is to employ sophistry to develop any kind of definition: all sculpture is three dimensional, therefore all three dimensional objects are sculpture. Of course this does not necessarily follow. 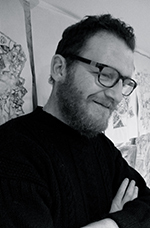 Clough has used drawing for sculpture and vice versa. 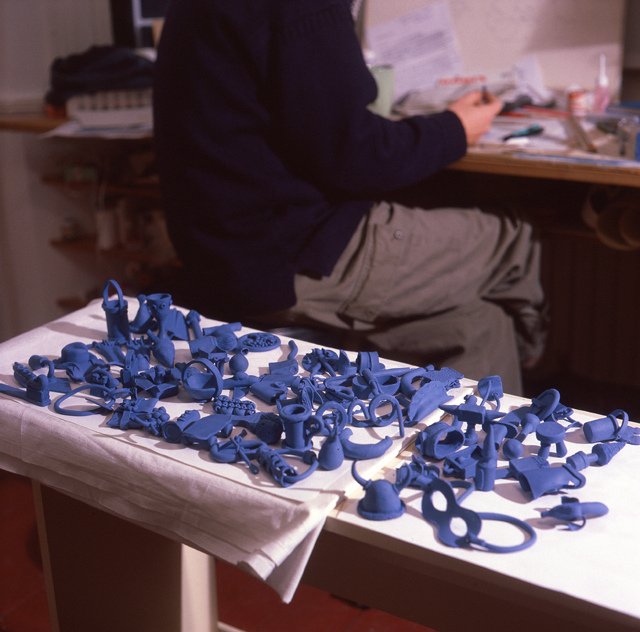 Sculpture for Drawing 1996, a wall piece in plasticine, framed under glass was shown at the Tate Gallery, St. Ives. In a way it speaks the same language as a charcoal drawing, frozen in time and space under glass. It could be argued that a sculpture was sneaked into the Tate as a drawing. There is no intended narrative and apart from a fleeting reference in Prosthetic – Home, Home on the Range 1999, there is little that is autobiographical. In the new body of work Clough makes drawings on the wall in ink. The image is painted over, the ink is activated by the wet paint and bleeds through it. The application of one material onto another leaves a thin residue partially obscuring the drawing, the two layers fuse to perhaps less than a millimetre thick. From drawing to sculpture? The objects depicted in Clough’s Little Bleeders look as if they could be made into tangible three dimensional forms. As if to prove this he is currently working with model makers, who will attempt t interpret them through one point perspective drawings. The Airfix Kit drawings look feasible, but they are in fact a distilled, abbreviated hybrid using mixed perspective viewpoints. There are familiar forms that trigger recognition of real objects. The Airfix frame is a means of holding the component pieces together, but it also acts as a visual scaffolding, a picture frame. By placing the components in this way, Clough suggests real construction potential and confounds our expectations with a kind of inter-dimensional dyslexia. Jean Baudrillard, The System of Objects.